The White Tiger is Aravind Adiga’s first novel and it is an incredibly accomplished first book which paints a vivid if slightly dark picture of ‘the real India’. We follow the story of Balram Halwai son of a rickshaw puller also known as ‘The White Tiger’ (which is of course the rarest of all the feline family) and his journey from a boy in a small village to ‘an entrepreneur’ in the big city via a life of servitude as a driver and, rather ominously, murder. The story is undoubtedly a dark one and one in which Adiga is telling us of the corruption (which as Dovegreyreader brilliantly summed up in her review “just slimes off the page”) in India, its globalisation and how it has faired since the British moved out and American culture moved in. We see the darker sides of life out there that ‘tourists’ to India might not. Though this is a hard look at India and is very gritty for the reader, amongst the dark though there is humour thanks to such a wonderful protagonist. If you are puzzling over how a murderer could be likeable and funny then you need to read the book. Mind you there are a few other novels where I have felt that way too… oh dear, should I worry? Balram’s personality changes as his surroundings do. He starts of as a naïve but clever school boy, and then becomes a disheartened young man in the tea shops before becoming a wry, calculating and knowing servant to his repugnant masters. He tells us; actually he isn’t telling us his story he is telling it to someone else. We read his story told in the form of letters to The Premiere of China. Which is oddly the only bit of the book that I didn’t really take to as I couldn’t work out why you would tell such a tale and admit to the things that he does if it might very well end up on the desk of someone as important as that. Bar that one glitch I found the book incredible. It’s so readable and that was all down to Balram and his character (the font of a book helps though I find, more on that next week). I thought the way Adiga managed the plotting and story so we got to see so much of Indian life quite remarkable. We started in the villages looking at education, death, marriage and people who may be poor but make their life as rich as possible through the hard times (Balram’s Gran is a brilliantly calculating old woman – but then you would need to be). In Delhi we get the mix of the richest of the rich, the corruption of the government, the globalisation and Americanisation of the cities and all its gloss and glamour and the in contrast the prostitution, slum dwelling, and the life of those in servitude – the cockroach scenes freaked me out. 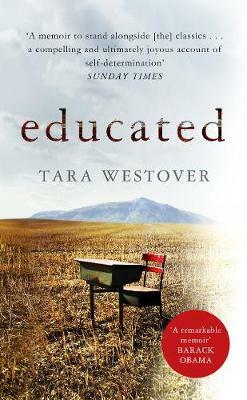 All in all a great narrator, an unusual look at, and insight into, India and a highly accomplished debut novel. I look forward to more novels by Adiga and hope that we see more novels from him. Arundhati Roy is an author I always wanted to read more works of after ‘The God of Small Things’ her Booker Winner but sadly we never did, maybe she is biding her time? One thing I will add about the book is the amount of people that I have seen reading it on the tube, I was going to do my report on that this weekend but I am going to hold off another week as am finding it quite interesting. Right I am off to read in the glorious Sunday sunshine. Managed Many of the Man Bookers? I was wondering how I could encorporate Harriet Devines very interesting blog on Man Booker winners into one of my blogs. 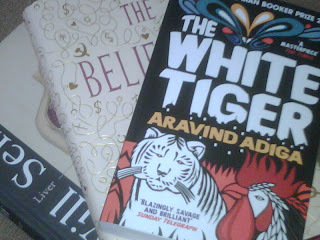 Then I got a lovely parcel of books through the door yesterday which included Liver by Will Self, The Believers by Zoe Heller and The White Tiger by Aravind Adiga. The later was the perfect excuse to talk about Man Booker winners you have managed. I have checked in my TBR pile and TBR boxes and I have quite a few winners, short listed and long listed books to go through so as I do I shall keep you posted. The White Tiger will be going straight to the top 5 of my TBR. I just want to read the shortlisted Secret Scripture by Sebastian Barry and the longlisted Child 44 by Tom Rob Smith. I will add the tag Man Booker to any that have won etc. So have I missed any great ones? Which ones would you recommend I get onto right now and which ones I should possibly avoid?